The Most Decadent Diet Ever! : The cookbook that reveals the secrets to cooking your favorites in a healthier way was created by Devin Alexander, who is a chef and author of the New York Times bestseller, The Biggest Loser Cookbook. In this book Alexander promises that you can enjoy America’s all-time favorite foods while still managing to lose weight. She shares her recipes for indulgent meals that have been transformed into healthy and guilt-free (yet still very delicious) versions of the originals. Alexander says that she lost fifty-five pounds by eating this way and has kept the weight off for over sixteen years. However, she reminds dieters that although The Most Decadent Diet Ever recipes have reduced calories, it is still necessary to monitor your portions if you want to lose weight. The book provides a selection of delicious healthy recipes and is divided into chapters such as breakfasts, burgers, sandwiches and wraps, salads, entrees, starchy sides, savory snacks and sweet snacks. The recipes include a selection of comfort foods and indulgent treats that have been made healthier by reducing their levels of fat and calories. For example, a typical slice of chocolate cake has 746 calories and 38 grams of fat, whereas Alexander’s recipe for Dark Chocolate Layer Cake with Buttercream Frosting has just 294 calories and 6 grams of fat. 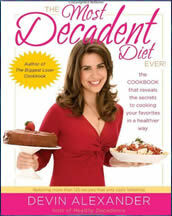 The Most Decadent Diet Ever offers similar adaptations of American favorites including BBQ Bacon Cheeseburgers, “Fried” Jumbo Shrimp, Super-Stuffed Steak Soft Tacos, Eggplant Parmesan and Chocolate Chip Pancakes. Each recipe is 100, 200, 300, 400, or 500 calories, which makes it simple to adapt the meals into any calorie-controlled weight management plan that you may be following. Alexander also outlines a simple dietary guide based on your gender, age and activity level and shows you how to put together a weekly meal plan. Fruit, vegetables, light cheese, fat-free milk, yogurt, chicken breast, turkey, bacon, blue cheese, lean beef, olive oil, peanut butter, chocolate. The Most Decadent Diet Ever is primarily a cookbook but Alexander does offer some general advice on how to include regular exercise into your daily routine. She discusses the importance of exercise for weight loss and explains how it helps to burn calories. The Most Decadent Diet Ever! : The cookbook that reveals the secrets to cooking your favorites in a healthier way retails at $19.95. Family friendly approach to healthy weight loss. Written by an acclaimed chef. Recipes are easy to prepare. Recipes include detailed nutritional information. Includes a general diet plan. Necessary to exercise portion control. The Most Decadent Diet Ever offers you a way to enjoy your favorite foods and lose weight without ever feeling like you are dieting. Alexander’s recipes appear to be indulgent and are delicious, yet still manage to fit within the parameters of what is regarded as a healthy diet to support weight management. Nevertheless, it will still be necessary for dieters to maintain awareness of portion control or calorie intake when eating these meals because, even though they are healthy, they still have the potential lead to weight gain if eaten in excessive quantities.